When Samsung announced the Galaxy Alpha, I was a bit shocked at first. It was very clear that Samsung was making an attempt to step up its design game a bit. Well, here we are beyond its release and today we’re going to find out what the Galaxy Alpha is all about. It may not be a life changing device, but for Samsung it’s definitely a step in the right direction. 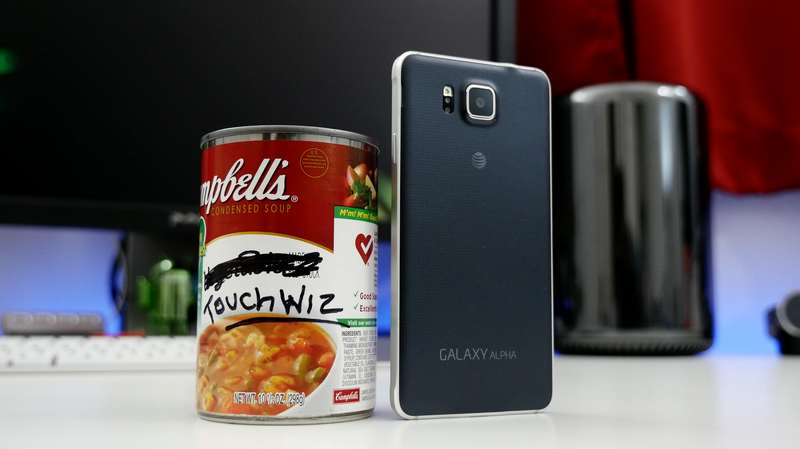 I don’t mean this in a bad way, but I like to think of the Galaxy Alpha as TouchWiz in a can. The canned version of something is pretty much always going to be more compact than the boxed version, with a few sacrifices (maybe taste or features in this scenario) and mostly have a better shelf life (or durability). This explains the Galaxy Alpha. I’m not saying plastic is weak, but metal is usually better for pretty much everything. First off, let’s take a look at specifications. The Samsung Galaxy Alpha features a 4.7-inch Super AMOLED display with a resolution of 1,280 x 720 (312 pip), a quad-core Snapdragon 801 processor clocked at 2.5GHz, 2GB of RAM, 32 GB of internal storage (no SD card slot), and an 1,860 mAh battery. As far as design is concerned, this is almost everything I’ve ever wanted to see from a Samsung smartphone. It has a very solid build thanks to its metal frame, but unfortunately we’re still left with a soft plastic backside that’s removable in order to access the 1,860mAh battery. I was never a big fan of the scratch prone chamfered edges on the iPhone 5 or 5s and the same rules apply here. Don’t get me wrong, they look nice, but in my experience they just end up scratching over time. The Galaxy Alpha wants to be a flagship so bad, but I don’t think it was ever destined for that. It’s certainly one of the best builds from Samsung to date, but some of its features just seem to be deliberately minimized. It’s like Samsung didn’t want the Alpha to compete with the metal-framed Note 4 or overpower the Galaxy S5. Either way, this is a very sleek and light device, but more than anything I like what Samsung is doing. I can’t say no to this change in design. 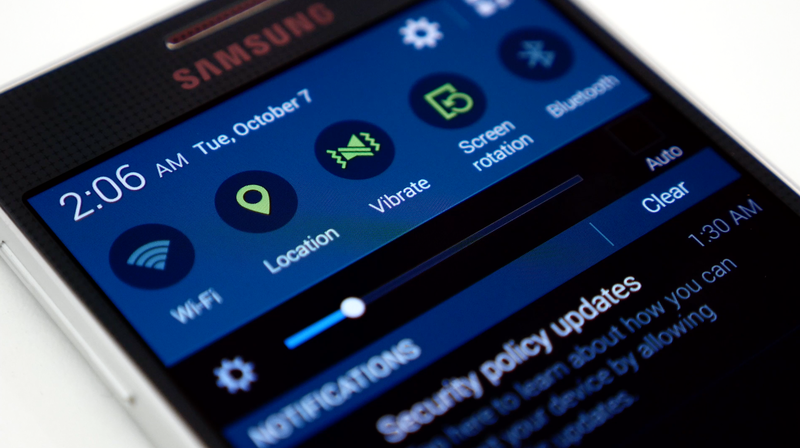 On the left side of the Galaxy Alpha you’ll find its volume rocker, while the right side is home to the power button. Along the top, you’ll find a small microphone and a 3.5mm headphone jack. Moving along to the bottom is where the speaker, main microphone, and Micro USB port reside. The front panel is home to a 2.1-megapixel front facing camera, earpiece, the appropriate sensors, and a home button with a built in fingerprint scanner. Finally, on the backside you’ll find a 12-megapixel rear camera capable of shooting up to UHD video quality, LED flash, and a heart rate sensor. If you take away the metal frame and compact body, you almost have a Galaxy S5. The keyword being “almost,” but there are a few key differences that make the Galaxy Alpha just a mid-range device. The performance on the Galaxy Alpha is pretty much what you’d expect. At its core, the Alpha has the same top-of-the-line processor and RAM when compared to its brother the Galaxy S5. So performance is going to be nearly identical between the two. The Galaxy Alpha has a 720p PenTile AMOLED display, and while I’m not a display expert, it doesn’t seem too far off from the visual quality of the display found on Samsung’s Galaxy S5. As with all AMOLED displays, the colors are a bit over-saturated and the viewing angles aren’t always great, but the pixel density is where you’ll notice the biggest difference with the Galaxy Alpha. At just 312 ppi, the Alpha is a step under the standard quality of most smartphones today. Yes, you can see pixels, but only if you’re looking for pixels. It’s not a deal breaker for me, but the display can make or break a device in a split second. 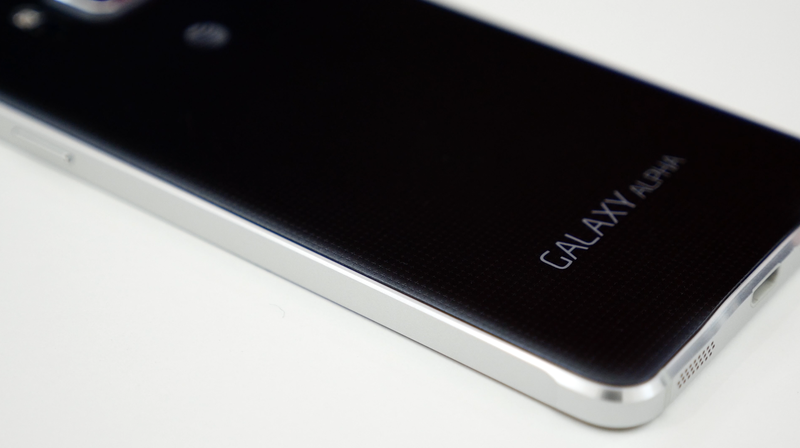 The Galaxy Alpha’s 4.7-inch 720p display. Well, this is a phone so I’ll briefly discuss call quality. It’s fine. My Galaxy Alpha is running on the AT&T network and I’ve had zero issues in my area. Though your mileage may vary based on your location. Also, the bottom speaker is pretty good. It’s not going to replace your favorite Bluetooth speaker, but it’ll get the job done for a conversation or playing some music. As for camera quality, you’re not getting Samsung’s best here. The 12-megapixel shooter is a step below the S5’s 16-megapixel camera for some intentional reason, though I’m not sure what that reason is at this point. Pictures are decent, but nothing I’d use to compare with other high-end smartphone shooters on the market. Again, this just seems like a step down to prevent this phone from being too popular or outselling Samsung’s current flagships. For most consumers, the camera will do just fine, but those with an eye for detail may want to look elsewhere. Ah yes, TouchWiz in a can. Because this is running Android 4.4.4 skinned with Samsung’s TouchWiz overlay, you’ll get the same features that come along with the Galaxy S5. The same exact features. As far as software goes, this is a star performer. Like the S5 you’ll find Multi-window, Ultra-Power saving mode, Toolbox, S Finder, S Voice, and other Samsung features we’ve grown to know. As I mentioned before, the Alpha comes with S Health and a heart rate sensor, along with a fingerprint scanner. If you’d like a closer look at the software features that the Galaxy Alpha has to offer, I recommend checking out our Galaxy S5 review. The 1,860mAh battery in the Alpha was a bit concerning to me at first. I just assumed the battery life would be poop. Well, it’s not too bad. I could regularly make it from morning to night with no problems, but that was with just average use. When the Alpha is put to the test with constant web browsing, games, and other activities at anything above a reasonable brightness setting, the battery quickly diminishes. Let’s just say that the Alpha’s battery life is okay. At the end of the day, this is nothing more than a beautiful experiment in my eyes. Samsung wanted to play Dr. Frankenstein and the Alpha was going to be its monster. While there is a lot of beauty in this beast, I’m more excited about the future that lies ahead. Samsung is definitely on the right track and maybe the Alpha’s successor will be just what the doctor ordered. Until then, we still have TouchWiz in a can. It’s not bad, but it’s not great. It just is… and for now, I’m okay with that I guess. Let’s just see this design trend continue on past the Note 4. Samsung’s Galaxy Alpha is available from AT&T for $149 on-contract or $612 off-contract.